(Nanowerk Spotlight) Thanks to nanotechnologies, in particular nanoelectronics, the medical sector is about to undergo deep changes by exploiting the traditional strengths of the semiconductor industry – miniaturization and integration. While conventional electronics have already found many applications in biomedicine – medical monitoring of vital signals, biophysical studies of excitable tissues, implantable electrodes for brain stimulation, pacemakers, and limb stimulation – the use of nanomaterials and nanoscale applications will bring a further push towards implanted electronics in the human body. In previous Nanowerk Spotlights we have already covered numerous research advances in this area: The development of a nanobioelectronic system that triggers enzyme activity and, in a similar vein, the electrically triggered drug release from smart nanomembranes; an artificial retina for color vision; nanomaterial-based breathalyzers as diagnostic tools; nanogenerators to power self-sustained biosystems and implants; future bio-nanotechnology might even use computer chips inside living cells. A lot of nanotechnology work is going on in the area of brain research. For instance the use of a carbon nanotube rope to electrically stimulate neural stem cells; nanotechnology to repair the brain and other advances in fabricating nanomaterial-neural interfaces for signal generation. A bit further out, and actually beyond the scope of medicine are efforts to build artificial brains – something that is called neuromorphic engineering: a new interdisciplinary discipline that includes nanotechnologies and whose goal is to design artificial neural systems with physical architectures similar to biological nervous systems. International cooperation in this field has also picked up. Just recently, scientists have formed a global alliance for nanobioelectronics to rapidly find solutions for neurological disorders; the EuroNanoBio project is a Support Action funded under the 7th Framework Programme of the European Union; and ENIAC, the European Technology Platform on nanoelectronics, has decided to make the development of medical applications one of its main objectives. In a new perspective article in the July 31, 2012, online edition of ACS Nano ("The Smartest Materials: The Future of Nanoelectronics in Medicine"), Tzahi Cohen-Karni (a researcher in Kohane's lab), Robert Langer, and Daniel S. Kohane provide an overview of where did nanotechnology start in this field, and nanoelectronics' potential in the biomedical sciences. Nanomaterials in biomedicine. (A) Zero-dimensional (0D) nanoparticles for triggered release of drugs. Transmission electron micrograph (TEM) of superparamagnetic iron oxide nanoparticles. Inset: Diffraction pattern suggests an ensemble of randomly oriented crystalline particles. (B) Proposed schematic of a cross section of a nanocomposite membrane, showing nanogel particles (blue), iron oxide nanoparticles (dark brown), and an ethylcellulose matrix (light brown). Upon application of an oscillating magnetic field, the ferromagnetic iron oxide nanoparticles release heat (orange) and reversibly shrink the nanogels, enabling release of a drug (green) from a reservoir contained by the membrane. (C) One-dimensional (1D) nanowires in tissue engineering. (I) TEM of a typical distribution of gold nanowires, with an average length of ∼1 µm and average diameter of 30 nm. (II,III) SEM revealed that the nanowires (1 mg mL?1) assembled within the pore walls of the scaffold into star-shaped structures with a total length scale of 5 ∼m. The assembled wires were distributed homogeneously within the matrix (II) at a distance of ∼5 µm from one another (III). (D) Three-dimensional (3D) self-assembled nanostructures. (I) Peptide amphiphile monomer composed of three segmental domains: a sequence bearing a biological signal, a domain containing amino acids with a strong tendency to form β-sheets, and a hydrophobic alkyl tail. (II) Simulated structure that will form is a cylindrical aggregate in which twisted β-sheets (red) collapse through hydrophobic interactions among alkyl chains, thus displaying high densities of the biological signal. The blue regions represent water domains present in the interior of the supramolecular structure. They write that, as with many other areas of scientific endeavor in recent decades, continued progress will require the convergence of multiple disciplines, including chemistry, biology, electrical engineering, computer science, optics, material science, drug delivery, and numerous medical disciplines. "Advances in this research could lead to extremely sophisticated smart materials with multifunctional capabilities that are built in – literally hard-wired. The impact of this research could cover the spectrum of biomedical possibilities from diagnostic studies to the creation of cyborgs." In their article, the scientists show that nanotechnology offers many avenues for progress in the area of implanted (nano)electronics. 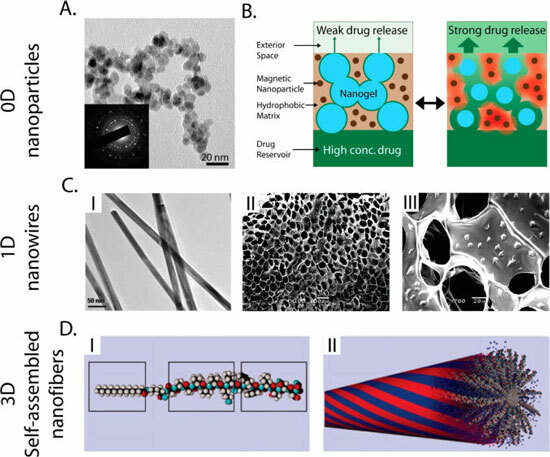 They list relevant nanomaterials and give examples of a wide range of purposes for such devices, including "delivery of molecules of interest, tissue engineering, and nanogenerators for self-sustained biosystems. One-dimensional nanostructures such as nanowires and nanotubes serve as promising nanoelectronic building blocks for a variety of applications including sensing, photonics, energy conversion, and electrical devices capable of forming complex logical functions." They caution that the development of nanoelectronics closely associated with tissues will have to address numerous issues other than the development of intricate circuitry: "Biocompatibility (local and systemic toxicity) may be particularly important because many of the materials used in the fabrication of nanoelectronics (for conduction, insulation, and support) are neither closely related to commonly used biomaterials nor known to be biodegradable." Outside the body, diagnostic systems will benefit hugely from nanoscale applications. "The close integration of nanomaterials with cells and tissues will allow the development of in vitro platforms for basic research or diagnostics. Such lab-on-a-chip systems could, for example, enable testing of the effects of candidate therapeutic molecules on intercellular, single-cell, and even intracellular electrical activity. Furthermore, by the assembly and fabrication of multiple devices per chip, it is possible to investigate the effects of multiple analytes on cellular processes at a spatiotemporal resolution not easily achievable by other means." However, future applications in nanobiotechnology might see the integration of nanoscale sensors inside engineered living tissues that are integrated as closely as the nervous system is within native tissue. These embedded nanostructures could also serve as stimulators for the surrounding tissue or trigger the release of bioactive molecules stored in nearby nanocontainers. "Sensing and stimulation could be linked, creating closed-loop feedback systems that would be analogous to reflex arcs in the autonomic nervous system." Ultimately, and here we are getting almost into science fiction territory, nanostructures could not only incorporate sensing and stimulating capabilities but also potentially introduce computational capabilities and energy-generating elements. "In this way, one could fabricate a truly independent system that senses and analyzes signals, initiates interventions, and is self-sustained. Future developments in this direction could, for example, lead to a synthetic nanoelectronic autonomic nervous system."